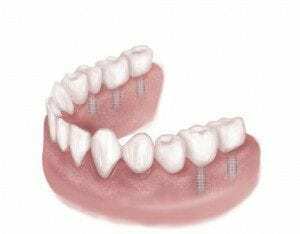 When more than one tooth is missing, there are three common treatment options: the traditional tooth supported bridge, a removable partial denture and an implant supported bridge. In this situation the benefits of implant-supported teeth are even more obvious. A removable prosthesis, such as a partial denture, actually accelerates the bone resorption (deterioration) process that occurs naturally when teeth are lost or removed. 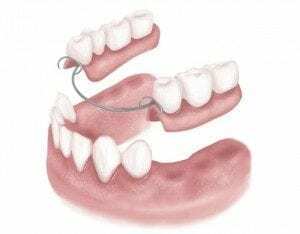 In addition, the clasps that hold the partial denture in place put significant pressure on the natural teeth they hook onto, loosening them and in many cases, eventually leading to the loss of those teeth. Most patients with partial dentures state that they are uncomfortable and that they rarely wear them. Partials accelerate the bone deterioration that occurs when teeth are missing. Replacing teeth with implant-supported bridges provides function and esthetics similar to natural teeth. They look feel and function like natural teeth. They are much more comfortable and stable than partial dentures. Natural biting and chewing capacity is restored. They virtually stop the bone resorption (deterioration) process. The integrity of the facial structures is maintained. Adjacent natural teeth are not compromised (ground down into peg shapes or loosened). Give us a call at any of our offices in the Baltimore area, for a consultation or for more information on replacing multiple missing teeth. “ This is an outstanding practice – well managed, organized, warm, and very professional… ” – Claudia H.
By checking this box you hereby agree to hold The Maryland Center for Oral Surgery and Dental Implants, including its doctors and affiliates, harmless from any hacking or any other unauthorized use of your personal information by outside parties. By checking this box, you also agree to receive email communication from The Maryland Center for Oral Surgery and Dental Implants.